Paula Wilson’s work in painting, printmaking, video, and installation generates a world simultaneously realistic and otherworldly. 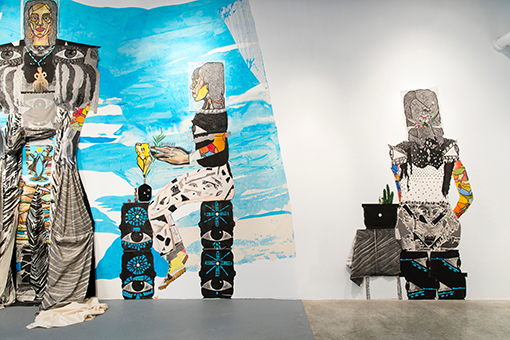 Dense layering of color, image, and pattern in her pieces act as a visual metaphor for the complex stratum of histories and cultures that inform the work. 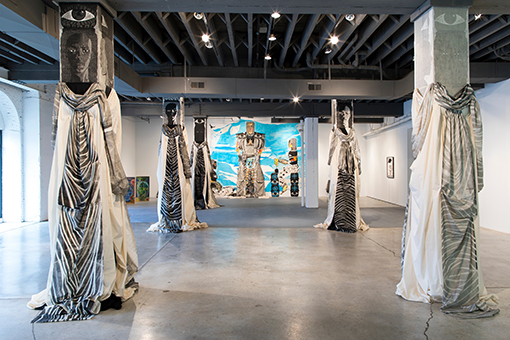 For her exhibition, Paula Wilson: The Backward Glance, the artist creates a processional space wherein ancient themes meet contemporary expression. 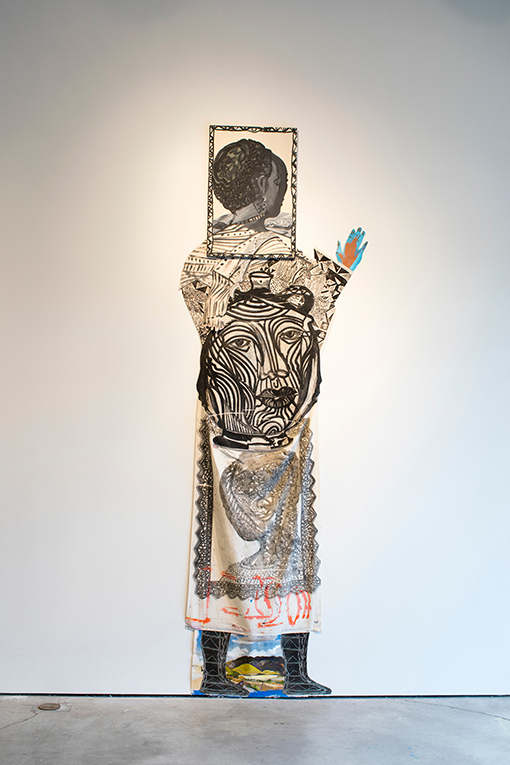 Mining her ongoing investigations of race, identity, and objectification of the female body, this mise-en-scéne transports viewers into a mythical creation story composed of paintings, video, and prints on fabric. The six columns in the gallery’s center are a reimagining of the Athenian Acropolis’s caryatids—supporting marble pillars carved as draped female figures. In 1803, Lord Elgin removed one of the caryatids for his own collection, now housed in the British Museum. Wilson’s stoic females allude to this controversial event and show the five remaining caryatids as variant profiles of the artist herself. By seizing the identity of these historic heroines, the artist takes control and constructs an alternative narrative—a new and imaginative way forward for the displaced figure separated from her five sisters. 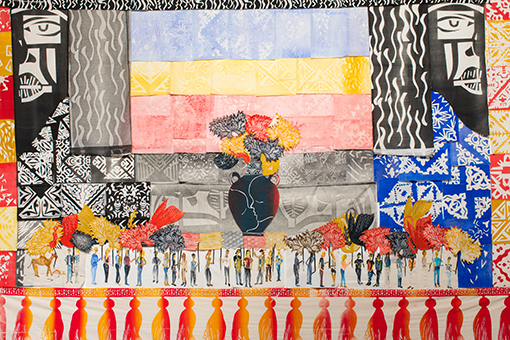 The black-and-white, four-sided caryatids on the square pillars give way to a colorful wall-sized collage. Released from the static block, each portrait becomes its own figure and strikes a bold pose against a cerulean sky. Their contemporary outfits, layered like spolia, show a fiercely creative spirit while the grouping argues for a bi-racial and multi-faceted embrace of self. Holding their own, goddess like, they are one. We and the caryatids are free to move within new and imagined landscapes of our own. 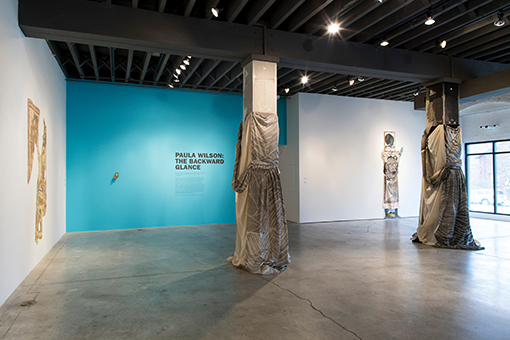 Based in Carrizozo, New Mexico, Paula Wilson is a multi-disciplinary artist whose work is included in the collections of The Studio Museum Harlem (New York), Yale University Art Gallery (New Haven), Mildred Lane Kemper Art Museum (St. Louis), and Saatchi Gallery (London), among others. 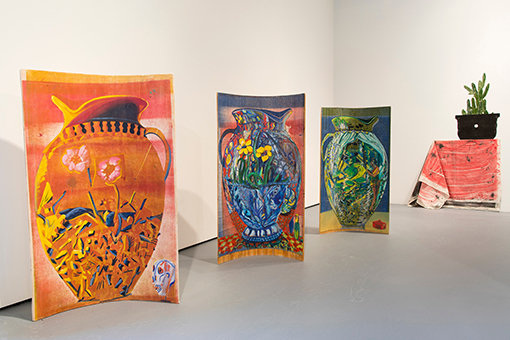 Previous solo exhibitions have been at Cherry & Lucic (Portland), The Fabric Workshop and Museum (Philadelphia), and the Center for Contemporary Arts (Santa Fe). She holds a Masters of Fine Art from Columbia University and presently co-runs the artist-founded organization MoMAZoZo and the Carrizozo Colony. 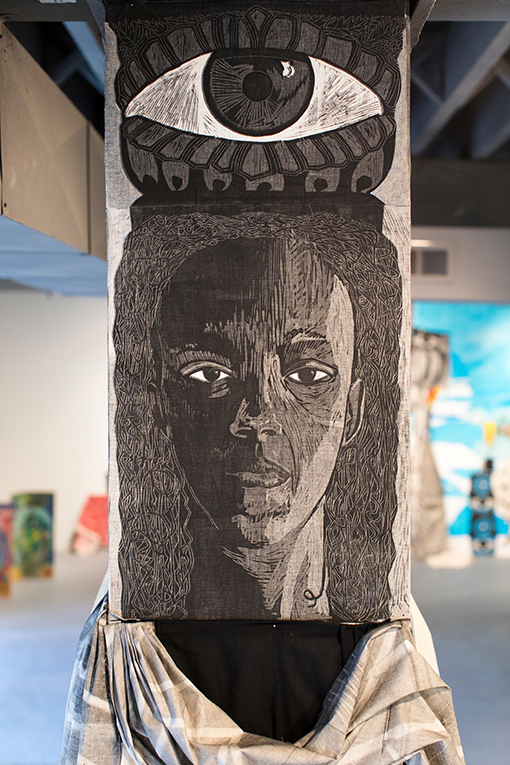 Paula Wilson: The Backward Glance is curated by Chris Cook, Bemis Center Executive Director.